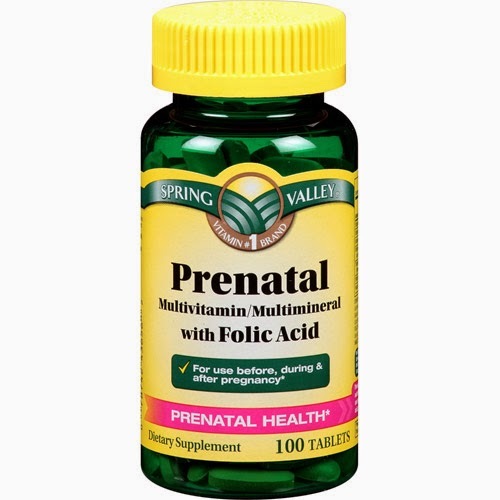 Pregnant women are encouraged to take folic acid before and during pregnancy. I just read a bit of interesting research that suggests the addition of folic acid to the American diet through fortifying our foods has prevented “natural selection” from occurring and allowing children with a predisposition to autism to be born (Rogers, 2008). Rogers (2008) hypothesizes that maternal folate nutritional status through a fortified diet or supplemented before and during pregnancy with folic acid has reduced the incidence of infants born with open neural tube defects (e.g., spina bifida), but questions whether the improved folate status masked adverse biological effects associated with limited methylation (the body’s way of detoxifying itself) and prevented fetuses with a common polymorphism (mutation) from being miscarried. This polymorphism is commonly referred to as MTHFR (MethyleneTetraHydroFolate Reductase), and the most common mutations are C677T and A1298C. A greatly simplified diagram of the methylation cycle. Rogers’ hypothesis agrees with an earlier study that concluded combined MTHFR mutations are likely to carry a selective disadvantage and contribute to decreased fetal viability (Isotalo, Wells & Donnelly, 2000). MTHFR plays an important role in folate metabolism and assists in the conversion of homocysteine into methionine, which are amino acids in the methylation cycle. MTHFR polymorphisms are known to cause hyperhomocysteinemia (elevated levels of homocysteine), which occurs when the body is unable to methylate homocysteine properly. Neural Tube Defects (NTDs), stillbirths and recurrent miscarriages have all been associated with hyperhomocysteinemia, so this seems to be a plausible theory. Elevated levels of homocysteine and oxidative stress are characteristic of autism spectrum disorders. Ryan is homozygous (meaning he got one copy of the gene from me and one from my husband), which means his methylation status is severely compromised. Although MTHFR is not an uncommon polymorphism among the general population, research has shown it occurs at higher prevalence in individuals with autism spectrum disorders. A recent study by Park et al (2014) examined the role of C677T and A1298C polymorphisms in autistic individuals in South Korea. Their results showed significant association between A1298C and autism. Guo et al (2012) studied the effect of MTHFR C677T in Chinese Han (the ethnic majority in China) and suggested this polymorphism is a risk factor for autism in this population. The vast majority of cases of idiopathic autism do not exhibit genetic anomalies and epigenetics may be important in the etiology of autism (Goin et al, 2009). Epigenetics refers to changes in gene status without changes to the DNA sequence. Methylation status is a type of epigenetic change. Not every gene in our bodies is active at all times, but are “switched on and off”. DNA methylation can “turn off” certain genes by tagging them with a methyl group. Research by James et al (2004) suggests that autism has an association with metabolic anomalies that contribute to hypomethylation (low methylation status) of DNA and found children with regressive autism had metabolic profiles consistent with impaired DNA methylation capacity. In two independent National Institutes of Health (NIH)-funded studies, Reif et al (2008) studied adverse events (AE) following Vaccinia (small pox) vaccination in populations and concluded in both studies that MTHFR polymorphisms were associated with AEs. I could find no studies that examined the occurrence of AEs in populations with MTHFR polymorphisms with other vaccination types. However, it seems possible if the prevalence of AEs following small pox vaccination is higher among individuals with MTHFR polymorphisms, this population could be susceptible to AEs caused by other vaccines. The cause of autism is still unknown, but it is generally accepted that it occurs where there is a genetic predisposition to environmental insults. Perhaps MTHFR with its effect on methylation status is one such genetic marker that could help identify vulnerable populations. Guo, T., Chen, H., Liu, B., Ji, W., Yang, C. (2012). Methylenetetrahydrofolate Reductase Polymorphisms. Genetic Testing and Molecular Biomarkers, Vol. 16(8), 968 – 973. Isotalo, P. A., Wells, G. A., and Donnelly, J. G. (2000). Neonatal and Fetal MTHFR Genetic Polymorphisms: An Examination of C677T and A1298C Mutations. Am. J. Hum. Genet. 67: 986 – 990. James, S.J., Cutler, P., Melnyk, S., Jernigan, S., Janak, L., et al. (2004). Metabolic Biomarkers of increased Oxidative Stress and Impaired Methylation Capacity in Children with Autism. Am J. Clin Nutr, 80; 1611 – 1617. Park, JW., Ro, MJ., Pyun, JA. and Kwack, KB. (2014). MTHFR 1298A>C is a risk factor for autism spectrum disorder in the Korean population. Psychiatry Research, Vol. 215; 258 – 259. Reif, D.M., McKinney, B.A., Motsinger-Reif, A. A., Chanock, S.J., Edwards, K.M., Rock, M.T., et al. (2008). Genetic Basis for Adverse Events after Small Pox Vaccination. J Infect Dis 2009; 198: 16 – 22. Rogers, E.J. (2008). Has enhanced folate status during pregnancy altered natural selection and possibly Autism prevalence? A closer look at a possible link. Med Hypotheses 2008; 71: 406 – 410.